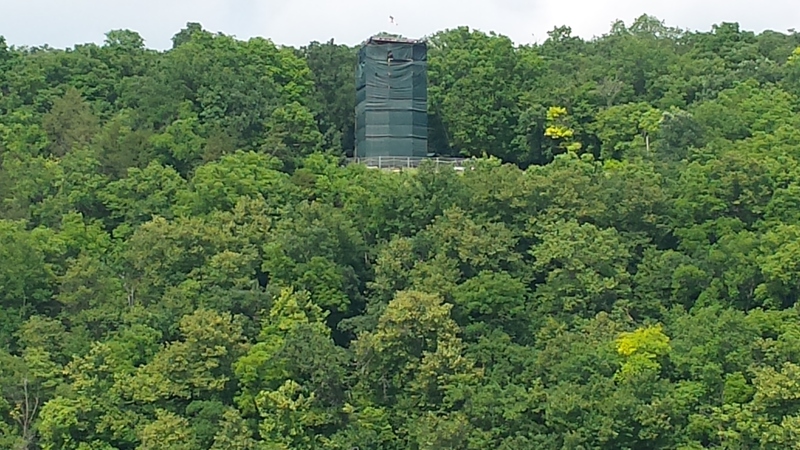 Wrapped statue above the Rock River, photo taken 30 June 2015. 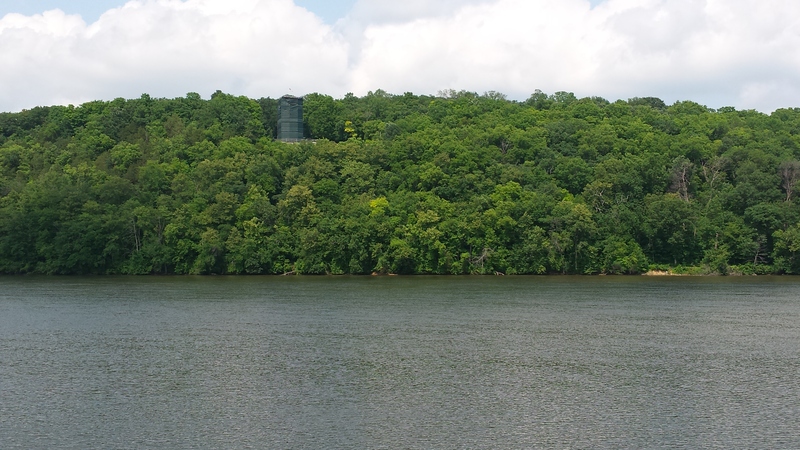 Zoomed-in image of 30 June 2015. 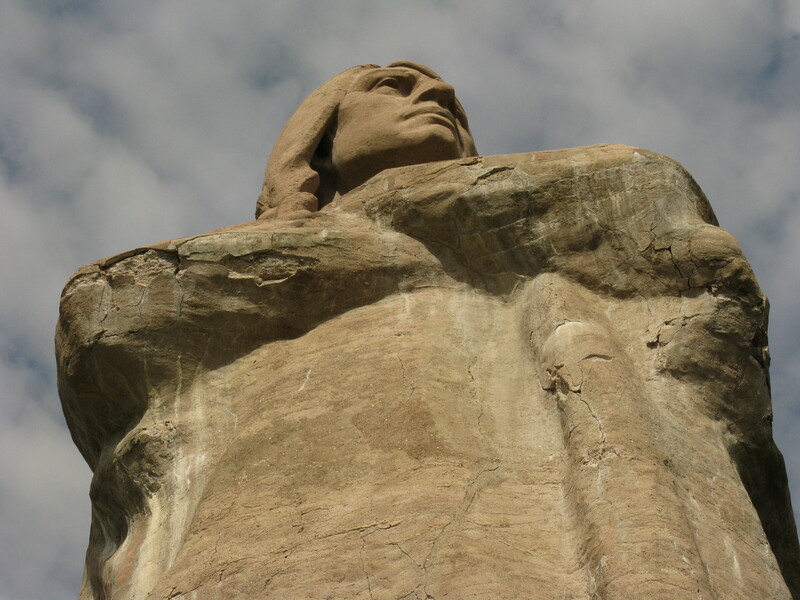 Photo of the 48-foot tall statue from below, taken Sept. 2011. Oregon, Illinois, 23 June 2015, about 9:42 a.m., on Madison street, just east of Fourth Street. I’m not sure, but the beard may be real. This was my view this morning as I sat inside Oregon’s McDonald’s. I took the picture because last week, I saw this same rig headed westbound on Madison with a load of mulch spilling out of some garbage cans in back of the wagon, and the dog running unleashed alongside. 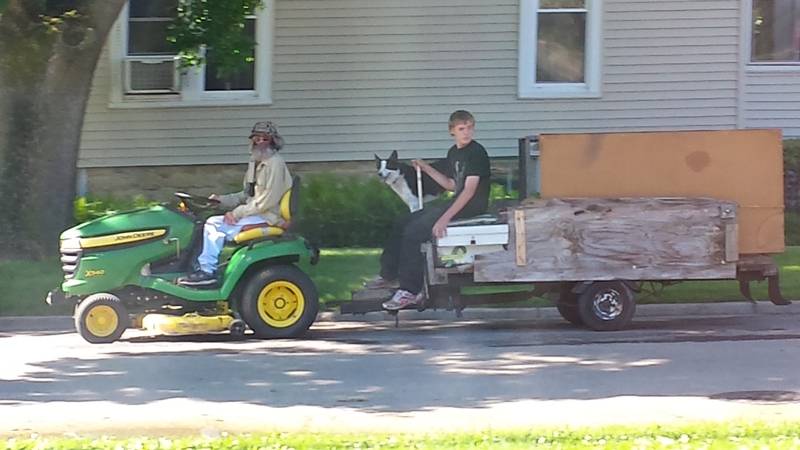 Today I saw either the homebound leg of a four-day outing, or an additional cross-town lawn-mower venture. I love the sound of that title phrase, and so I’m using it, and now I just gotta come up with some stuff to go with it. Trying to fill in a post with what one might expect to find under such a title seems banal, so let’s just explain that I haven’t posted in a while (because of busyness, tiredness, March) and want to get back in the ol’ saddle of blogging, so to speak. 1. Any minister who says “I’m just jokin’, I’m just jokin'” at a funeral, in the context of no perceptible joke, may not be doing a good job of funeralizing. Also, it may not help to remind the surviving spouse — in the middle of a prayer — that he’ll be facing lots of loneliness and dinners for one in his coming weeks and months. 2. I know I’ve spent too much time in my rural county when I travel one county east and am amazed at how beautiful strip malls can be. A Starbucks, for Pete’s sake, seems a like an oasis in the commercial desert that is my home county. This is the kind of thing that is easier to publish once one has already left. One’s neighbors tend not to appreciate such critiques. Of course, it’s far easier for one to up and leave than it is to stay and struggle. But what are ya gonna do? Just because it’d be nice if some kindly developers would come along and gentrify everything in Ogle County doesn’t mean they will. 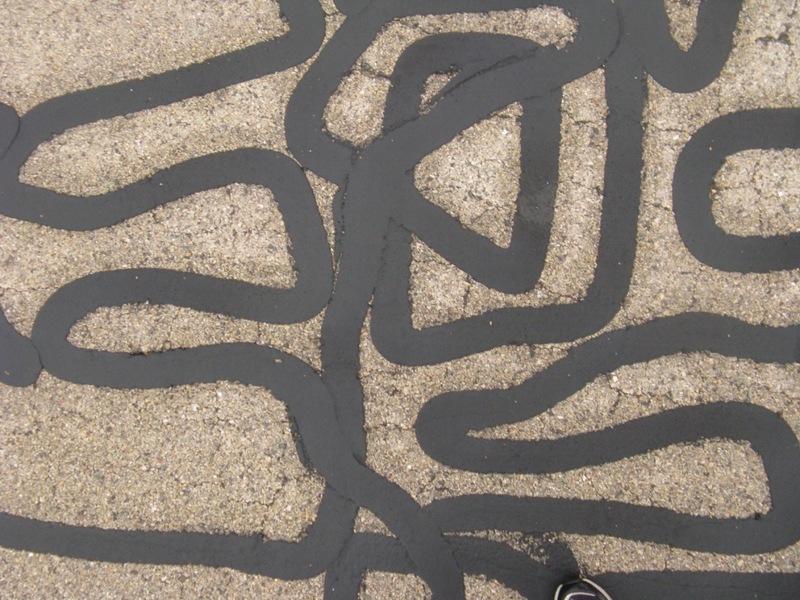 We suspect there’s a local road-maintenance worker who likes to make the work of filling pavement cracks an ode to the art of Keith Haring. We think of this person as a tar artist, or a “tartist.” There’s some compelling tartistry on display. 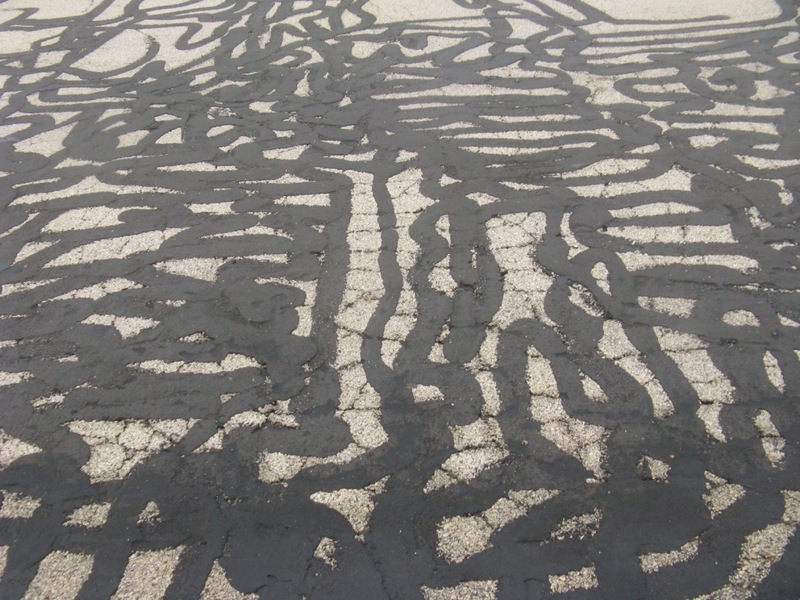 Also, when there’s more tar than pavement, maybe it’s time to re-pave. 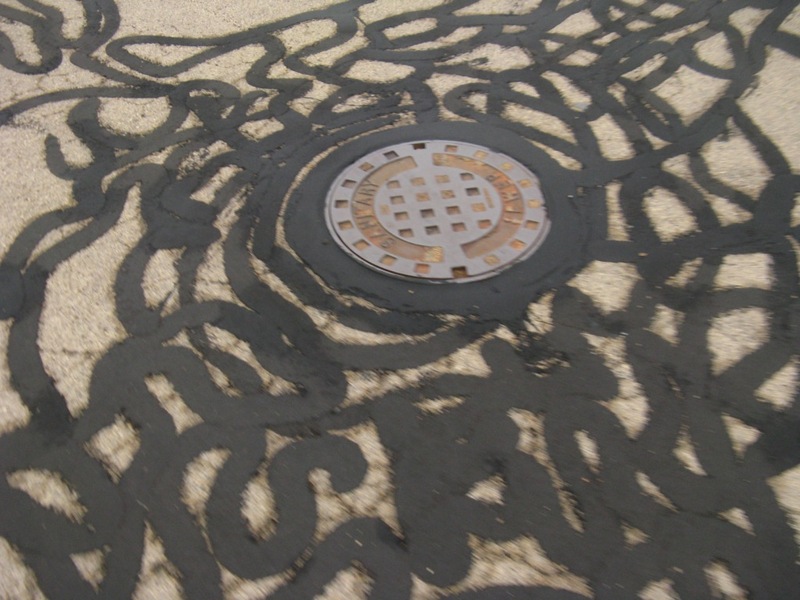 UPDATE: This neighborhood’s roads were repaved on or about 15 August 2013 — the art is gone! But the roads do make more sense now, monolithically speaking. UPDATE 2, Sept. 2014: For more unintentional Ogle County art, see here. In recent days, I’ve witnessed people saying things so terrible that I wonder if, and I hope that, I’m watching performance art. Maybe I’m seeing a set-up piece for a hidden-camera show like this one , or maybe the people involved are just trying to provoke others. If these things were happening in a big city or a college town, the “performance art” interpretation would be at least possible, but since I’m seeing and hearing these things in rural Ogle County, I’m afraid these people being so stereotypically hateful and racist may not be acting. But rather than accept that perhaps their anger were invalidating any other opinions they might have, they continued to complain: one woman said that someone wanted to bring “Muslims over here,” to which the other said, “we already got 8 million,” and then I missed a few words, and then I heard, “Let’s just hope somebody kills ’em,” which I thought referred to the Muslims, but my wife heard “kills ‘im,” which she interpreted as referring to the current U.S. President. This was so over-the-top obnoxious, not to mention nearly illegal, that I just started laughing, albeit bitterly. My wife said, let’s not get so angry when we get old. Let’s keep our minds in shape. I feel bad about publishing these words, but I’m doing so in hope that there’s some value in simply documenting things being said out loud in public spaces in small-town Illinois in 2013. Though I was angered by what I heard, I decided that rather than confront this man’s statements directly (anybody who would espouse these beliefs at this point in history seems to me someone who would also be resistant to being criticized or educated), I’d throw these online with the hope of reminding the rest of us that there still are people around who say these things. And surely not every Tea Party member says things like this, but here was one guy who sympathized with the Tea Party who did. He either fits the stereotype, or he’s just acting to get a rise out of others. But I didn’t see anybody directly challenge the old white ladies or this old white guy. I’m really hoping they’re just performance artists. And it turned out to be misleading. Our local officials continue to have our best interests at heart.